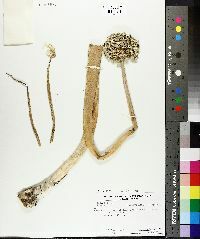 Bulbs 1-3, not rhizomatous, mostly depressed-globose, varying in size from cultivar to cultivar, 5-8 × 3-10 cm; outer coats enclosing 1 or more bulbs, yellowish brown, red, or white, membranous, without reticulation; inner coats white to pink, cells obscure to quadrate. Leaves persistent, 4-10, sheathing proximal 1/6-1/4 scape; blade fistulose, usually ± semicircular in cross section, 10-50 cm × 4-20 mm. Scape persistent, solitary, erect, fistulose, inflated below middle, 30-100 cm × 3-20 mm. Umbel persistent, erect, compact, to 500-flowered, globose, bulbils occasionally found; spathe bracts caducous, 2-3, 3-4-veined, ovate, ± equal, apex acute to acuminate. Flowers stellate to campanulate to urceolate, 3-7 mm; tepals erect to ± spreading, white to pink with greenish midveins, withering in fruit, margins entire, apex obtuse or acute, outer ovate, inner oblong; stamens exserted; anthers white; pollen white; ovary crestless; style linear, ± equaling stamens; stigma capitate, unlobed; pedicel 10-50 mm. Seed coat not known. Flowering Jun--Aug. Disturbed sites adjacent to areas where cultivated; 0--500 m; Ark., Calif., Kans., La., Mont., Oreg., Tex., Wash.; cultivated in Europe, Asia. The onion of commerce, Allium cepa is widely cultivated as a biennial in North America, Europe, and Asia. It is unknown in the wild and is probably derived from A. oschanini of central Asia. The cultivated form is often polyploid (2n = 16, 32, 54) and possibly of hybrid origin. It exists in numerous cultivars, a few of which form large bulbils in the umbel. Perennial herb with one to three bulbs flowering stem 30 cm - 1 m tall, inflated below the middle Leaves: four to ten, arising from the base, elongate, 10 cm - 0.5 m long, 4 mm - 2 cm wide, cylindrical, hollow. Inflorescence: an upright, rounded umbel of up to 500 flowers raised on a single hollow stalk and subtended by two to three deciduous bracts. Flowers: on long stalks (much longer than flowers), pink to white with greenish midveins, 3 - 7 mm long, star- to bell-shaped, with six tepals that wither in fruit. Stamens six, exserted. Fruit: a short, three-lobed capsule. Bulbs: varying in size, usually less than twice as long as wide, somewhat rounded, and encased in a yellowish brown, red, or white coating. Easily distinguished from the stem. 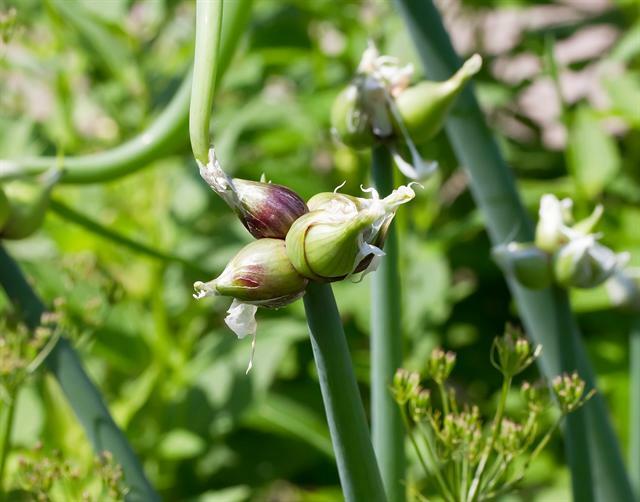 Similar species: The cylindrical, hollow leaves and inflated stems of this species and Allium fistulosum help distinguish them from other Allium found in the Chicago Region. Allium fistulosum differs from A. cepa by having flower stalks shorter or equal to the flowers. Habitat and ecology: Introduced from Asia. An occasional escape from cultivation or arising from food waste. Has been found along railroad tracks and in waste ground. Notes: Widely cultivated in North America, Europe, and Asia. 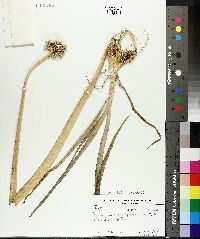 There are numerous cultivars derived from this species. Etymology: Allium comes from the Latin word for garlic. Cepa means onion.